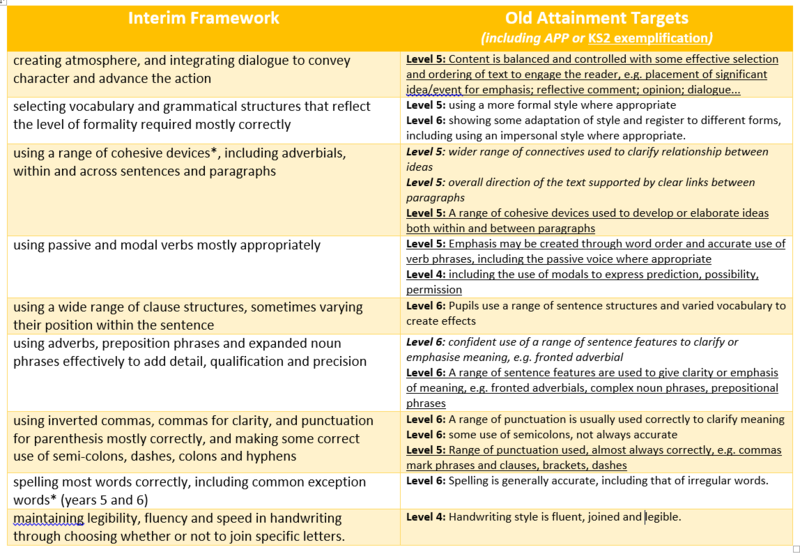 I can’t claim to have scrutinised them in full depth, and I urge anyone who teaching in KS1/2 to take a look at them, but here are my thoughts on the new interim assessment frameworks for KS1 and KS2. Firstly, let’s deal with that “I” word. You might have sensed in my July post (How dare they?) that I wasn’t too impressed by the poor progress on assessment from the department. To be offered an “interim” structure, after all this time strikes me as atrocious. Schools have not been offered the chance to teach an interim curriculum. We will not be judged on interim tests while we roll out the new curriculum to children who’ve been following the old for years. Schools have had no option but to move fast, and prepare to be evaluated by Ofsted. What a cheek to take a whole year since the draft performance descriptors were scrapped to come up with something that will only last a single year. It’s an embarrassment – especially for teachers who have to present to parents or governors about new systems. We’ve been let down, again, and the minister should apologise. This has been a slightly unpopular aspect of the proposals, but it’s not actually one I object to. I do, however, object to the way in which it has been handled. Part of the trouble of the old best-fit descriptors was the way in which a child could, for example, achieve Level 4 (or Level 5 for that matter) without knowing their tables, leaving a gaping chasm in their core knowledge. A threshold model avoids that problem by making it clear that pupils must secure all the core content. That’s a principle I broadly support. However, we were promised a new standard that would be broadly in line with the old level 4b (whatever that was). By that reckoning, the bar could have been raised that far simply by keeping the broad content of the old level 4 descriptors, and making them minimum thresholds. What has actually happened is a significant raising of the bar, and then the further raising by setting the expectation of complete security in all areas. That presents some real challenges in some areas. What of the child in Year 2 who reads competently with good understanding, but struggles to maintain a pace of 90 words per minute; are they to be deemed to be falling behind? What of the child in Year 6 whose motor control does not yet allow them to write with a neat and fluent hand; is the rest of their work therefore automatically not good enough to demonstrate the “greater depth”? A threshold standard is not of itself a bad thing, but it’s not something that should be hastily drafted. What happens to the children who are not yet Working Towards the Expected Standard, according to its new definition? In some cases – especially the Writing – that could be a good chunk of pupils. Do they simply get no result at all? When will see exemplification materials? What moderation processes will be in place? When will these judgements need to be made by? What on earth with be happening for our current Year 5s?! Maybe this is just the dying breath of a system of teacher assessment that has outlived its appreciation at the department. Since 2010 it has been made clear that government has no interest in coursework and similar approaches at GCSE; maybe the view is now that Teacher Assessment is a redundant process. Might we see the whole thing scrapped in 2017… under the banner of reducing teacher workload? I’m beginning to think that that wouldn’t be the worst outcome in the world! Apparently some people out there are not as avidly gripped when a new government document appears tucked away somewhere on the GOV.UK website. Indeed, some teachers might even deliberately avoid such things. And their blood pressure readings are probably all the better for it. Nevertheless, there are some important nuggets of information hidden in among the irritation, and so while I of course recommend reading all the bumph in full, here are some key points that teachers might find useful. The Assessment Commission reported this week, giving its advice for how schools should manage assessment during day-to-day and term-to-term activity. I’ve highlighted some particular paragraphs of interest, but the gist of the report is that schools shouldn’t be assessing for Ofsted, and that they need to move their focus away from summative levelled, banded, graded assessments, and focus more thoroughly on what children can and can’t do. Notably the report also has key information from Ofsted, stating that inspectors will not expect to see any particular form or regularity of data collection. Indeed, the report advises against anything more than termly data collection/analysis, and makes clear that inspectors will focus as much on books, observations and conversations as they will on any data that’s available. Of course, it remains to be seen how inspectors act on this in practice. If your school has bought in one of the awful electronic systems that requires millions of tick-boxes, or expects children to make x points of progress each term/year, then I strongly recommend reading the full report – or better still passing it to your headteacher. The results of the tests will be as scaled scores, with children who reach the threshold score for the “expected standard” being given a scaled score of 100. There will be some indication of a ‘higher’ standard (presumably simply marking those children who reach a certain higher score). None of the thresholds will be known until after the first round of tests in 2016. Samples of the test paper style and level of challenge are available from the DfE website. Two documents published this week set out the replacements for levels in the core subjects for teachers to use. They are expressly only for use at the end of Year 2 and Year 6. 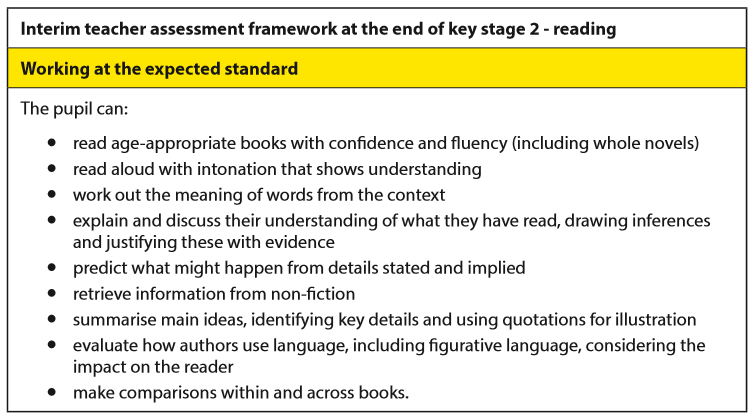 For each subject they set out a short list of bullet points, listing the criteria that children must meet to be judged as “working at the expected standard” (see the KS2 reading example, right). Note that these are threshold expectations, not ‘best fit’ criteria. It’s not clear that there’s been much joined up thinking with the test results, and the criteria are rather brief really. Expect “exemplification materials” later in the academic year – although who knows how close to the wire it’ll be before we actually see anything! For KS1 Reading, Writing and Maths, and for Writing at KS2, there are also descriptors that set out a band of attainment for lower attainers called “working towards the expected standard”, and also for more confident pupils, entitled “Working at greater depth within the expected standard” (snappily captioned WagDuties by @hayleyearl). Mercifully the ‘mastery’ label has gone! Don’t learn it by heart though – it’ll all be redundant by this time next year, as we wait again for information. First Published 17.09.15: The message that should have accompanied last year’s announcements of an interim teacher assessment framework for 2015-16, let alone the repeat this year. I hope your new term has started well, and that you and colleagues had an opportunity for some well-deserved rest over the summer break, given the rapid pace of change and the related workload that currently exists in schools. I wanted to write to you all to express my sincere thanks for the efforts your profession has put into managing the wholesale change taking place in the curriculum over recent years, and that continues to take place in the structure of national testing and assessment. I had honestly hoped that this term would begin with a full framework in place. Indeed, I had expected to be able to put everything in place well in advance, so that teachers would be well prepared for the changes we are marking. Unfortunately, I can only apologise for the delays that have beset us all and the additional challenges that this brings. It turns out that designing a replacement assessment system for the new curriculum has been a lot more difficult than we in the department realised. I appreciate that many of you have raised concerns about this over the recent years, and in particular over the timescales given over to implementing these changes. Again, I can only apologise here: we got it wrong. Despite the many experts available to the department, we have been unable to construct a purposeful and manageable assessment system for the new curriculum in good time. This failure is particularly striking, given the way in which schools up and down the country have risen to the challenge of the stringent timescales we set out for introducing the new curriculum. It is a matter of great embarrassment to me that we have not been able to match that success. In an effort to alleviate the most urgent of problems, the department has produced an interim framework for teacher assessment. We recognise the disappointment that will be felt as a result of this further delay in securing proper process; this was not our intention. I hope that in due course teachers will appreciate the need to spend further time on this work to ensure that we get it right. I appreciate the additional burdens this places on schools as they prepare both for the current year’s end-of-key-stage tests, and for those in forthcoming years. I have made it my duty to liaise with colleagues in Ofsted and the Regional Schools Commissioners’ offices to ensure that there is clarity in those teams about the challenges schools are facing. No school should find itself under further pressure and scrutiny because of errors made in this department. The task in the months and years ahead is for my department to work more closely with the profession, to plan out clear paths for developmental change, and to ensure that the barriers that currently prevent schools from developing the most effective approaches with curriculum and assessment are removed at the earliest convenience. I only hope that I can continue to draw on the evident willingness of the profession as we try to correct these mistakes for the benefit of the children for whom you so valiantly strive each day. We let you down on this, and my whole department recognises the need to make amends. I hope that we can steer a more proper path through the next stages of the process as we aim to bring together an effective system of assessment that supports teachers and learning without additional burdens. My head is full. After weeks (if not months and years) of chasing the department, they’ve decided to release everything at once, just to flummox me. Determined not to be beaten, I shall return to blog on the new interim (and don’t get me started on that right now) assessment frameworks for KS1 and KS2, and doubtless at some point to further berate the department for further delays, but for how I have just picked out one or two highlights from the Assessment Commission report as I see it. Firstly, let me say again that I have a good deal of time for the members of the commission. They also had a tough role in a limited time, and were hampered by the DfE’s decision to delay publication. However, I have to confess that overall I am slightly disappointed. Had this report been around two years ago, asking the important questions that it does, then it would have been really useful. But we’re a long way down this road now. Schools who waited and waited for guidance have been forced into making decisions about approaches and software, that are not easily abandoned to heed this new advice. Unfortunately, at this stage, pretty much the last thing schools needed was more questions. And while the questions raised are of vey high quality, they don’t fill the gaping void left by the lack of previous guidance. Couldn’t agree more on that. An argument I’ve long made, but which for many schools has simply not been possible. There is not so much spare capacity in our schools that lots of people have got spare time to be developing new approaches to assessment. And providers have been happy to plug that gap. I’ve spent hours working on assessment, it’s still not a finished system, and barely a single percent of that time, I would suspect, has taken place in school time. Not every school has an education geek with an understanding spouse! I only wish the report had been clearer in explaining that points of progress are a surefire way back to the march through levels. Given the pressure schools are under to track pupils’ progress towards end-of-key-stage targets, it seems almost inevitable to me that schools will want some form of representative assessment that follows the national style to support these judgements. I fully support the notion that these should not be the mainstay of assessment procedures, but it strikes me that to try to avoid them altogether would actually be foolish. The fault here lay squarely with the DfE and STA who produced draft performance descriptors that used the word mastery in exactly this way. It was inevitable that schools would follow suit. But let’s not get started on the performance descriptors… that’s for another post! Just one last thing to mention: the government’s response to the 6 recommendations made in the report? On setting up an assessment standing committee: they’re considering something (but no sign of committing to that). On training leaders and inspectors: they’re considering it. On assessment for SEN: they’ve actually set up an expert group here. So 1/6 ain’t bad. Quite why it took the whole summer to make decisions that consist largely of deciding to consider things, I have no idea! I hope you’ve had a relaxing summer and are feeling refreshed for the new parliamentary session. It seems a long time since we last heard from you, so I’m hoping we can catch up soon. You’ll recall that just before you broke up for the summer recess, there was a little bit of, shall we say ‘slippage’, on the publication of the Assessment Commission report. I have to confess, it would have been nice if you’d been able to let us know about that. It was a bit of a shock for it to emerge in the manner that it did – we thought that you were keen to develop effective relationships with us. It was a bit of a surprise to find that you reneged on that promised support right at the last minute, and only thought to let us know by hiding a message on a webpage. Of course, I know that you weren’t away sunning yourself all summer, so presumably any of the decisions that you needed to take in response to the report have now been made. After all, 8 weeks is quite a long time, as they sort-of say in politics. So, is there any chance we could have it now? It’s just, I know that it seems like a small thing to you, but it matters rather a lot to us. You see, governments of all shades have spent the past few years using the levers of curriculum and assessment to drive the changes they want to see in schools. And we’ve grown used to that; many of us don’t even mind it. That’s how democracy should work, I suppose. It’s just become increasingly hard to keep up lately. We used to talk about moving goalposts; it’s beginning to feel like we’ve come prepared for a football match only to find bails and wickets in the middle of the field. We were promised this report by the end of the summer term, which frankly was rather late after 2 years of little guidance, but to then take that away at the last moment seems particularly unfair. And the matter is only worsened by the lack of information about performance descriptors. I had to stand in a staff meeting today and apologise to the teachers in my school for an incomplete review of our internal assessment and tracking processes, because – to my frustration – I still have no idea what will be expected of us by May in terms of assessment of Writing. That’s not on really, is it? It feels almost churlish to remind you so soon after publication, but your department did say just a few months ago that “There should be a lead in time of at least a year for any accountability, curriculum or qualifications initiative coming from the department which requires schools to make significant changes which will have an impact on staff workload”. Now, perhaps we disagree on what constitutes a significant change, but don’t be under any illusions: the process of Teacher Assessment of Writing is no walk in the park. It’s a task that the most experienced of teachers find time-consuming and challenging; that burden will only massively increase with the introduction of new criteria. So there is no doubt in my mind that the impact on staff workload is huge – and to be having to fit that into heavy school improvement schedules mid-year presents real challenges. Anyway, I’m sure I’ve made my concerns clear. I know that teachers all over the country would really like to get on with focusing on teaching and learning, and would dearly like to meet the new high standards that you intend to set. But until you actually set them, that’s pretty tricky. And it’s doing nothing for that positive relationship that I’d really hoped might be built after the workload challenge doo-dah. It would be nice to think someone there was taking it seriously, really it would. P.S. I know you might need to, you know, get it photocopied or something, but… perhaps you could just tell us when we’ll actually get it. And maybe stick to it this time?